This article is written by Melina Abdullah, #BLM Organizer and Professor and Chair of Pan-African Studies, California State University, Los Angeles. It is the first in the Black Lives Matter Everywhere series, a collaboration between The Conversation, the Sydney Democracy Network and the Sydney Peace Foundation. To mark the awarding of the 2017 Sydney Peace Prize to the Black Lives Matter Global Network, the authors reflect on the roots of and responses to a movement that has reignited a global conversation about racism. The 2017 Sydney Peace Prize will be presented on November 2 (tickets here). Black Lives Matter is working for a world where Black lives are no longer intentionally and systematically targeted for demise. 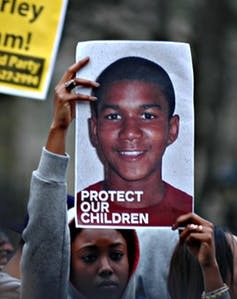 On July 13, 2013, hundreds of thousands of people – mostly Black people – flooded the streets of US cities following the acquittal of George Zimmerman, the neighbourhood watch volunteer who killed 17-year-old Trayvon Martin. For weeks, we had been glued to our televisions as police and “friends” of Zimmerman tried to disparage the high schooler – to make the victim some kind of predator. But we had seen his face. We saw his eyes dance, his brown skin glisten, and his smile warm hearts. He was a child, a lovely, beautiful boy-child who looked like our own children. And Zimmerman had no right to steal his life, regardless of what a court says. So, the verdict came down, and we erupted. Our spirits filled with the righteous indignation of generations past. Transgenerational memories came rushing back of Emmett Till. Trayvon was born to Sybrina Fulton and Tracy Martin, but he was ours – all of ours. Black bodies filled the streets, disrupting traffic, inhibiting White shoppers and making the normalcy of White American middle-class existence less certain. As our ranks swelled and our presence became more intentionally targeted at White epicentres of escapism (including tourist attractions like Hollywood and Highland), we began to understand the power of disruption. In disrupting these spaces, we refused to allow our collective pain to be confined to Black communities. Others may not see their own children in the face of Trayvon, but they would not be permitted to dismiss us. On the third day of protest, in the midst of our first freeway shutdown, a text message found its way to a few of us. It read like words from the Underground Railroad: “Meet at St. Elmo Village at 9pm” (a Black artist community in mid-city Los Angeles). The message was from Patrisse Cullors, a young, powerful, emerging organiser in Black Los Angeles whose work had centred on ending sheriffs’ violence. Her text was passed onto other organisers by Thandisizwe Chimurenga, a Black independent journalist who had been most recently active in the struggle for justice for Oscar Grant. As the summer night settled in and demonstrators scurried from highways, dodging the police who came in with sticks, beanbag guns and tear gas, the mamas collected our young children, walked home and prepared to go back out that same night. I was late to the meeting. By the time I arrived, a few dozen folks, including about ten of my spirit-children/students were closing out discussions of what it means to build “a movement, not a moment”. Many of us had been involved in what Brenda Stevenson terms “episodic organising”, or demands for justice that are limited to a person or a moment in time. But what we came to embrace that night is that the murder of Trayvon Martin, Oscar Grant before him, Devin Brown before him, Tyisha Miller before him, Margaret Mitchell before her … and so many others, was not accidental. Perhaps the names and specifics of each case unfolded independently, but the system of American policing was designed to produce these outcomes. The system is brutal, murderous and violent. Only by transforming the way that we vision justice can we realise peace. So, we committed to building a new peace movement – one that was driven by the way that Trayvon had embedded his spirit in our collective souls and opened itself to the chorus of voices whose bodies had been stolen by the state before and after him. All of this intuitive work had already happened prior to our gathering in the courtyard, and remains hugely important to the building of this movement. For a movement to grow, it must be organic, flowing from the hearts of the people. Every transformative struggle for justice has been rooted in heart work. Attempts to insert causes into communities ring as false and ultimately fall flat. The work of organisers, with the most effective organisers being part of the communities that they seek to organise, is to tap in to the souls of the community, hear the collective outcries and distil the issues and cast them in the context of a larger vision. They work to harness the energy as the movement builds and seize the time as communities make demands and arrive at solutions. Civil rights, Black Power and Black Lives Matter organiser Greg Akili says that organising is “getting people to move on their own behalf and in their own interest”. As the intuitive work was happening in the streets, Patrisse was assembling with Alicia Garzaand Opal Tometi to organise us, visioning beyond the moment and strategising how to build a new iteration of Black freedom struggle. Our mission emerged organically. It was summed up in the words penned by Alicia: “Black lives matter”. We have a right to our lives. Our children have a right to live and walk freely, without being hunted by the state, agents of the state, or wannabe agents of the state. This is not debatable. There are no two ways to see it. This is one of those very basic, fundamental truths. Getting to freedom and getting to justice, however, is a much more challenging charge. We are heirs of struggles that are also black-and-white: calls to end chattel slavery and lynching, demands for basic civil rights and voting rights, and the constant call for the end to police brutality. While a hawk’s-eye view of these demands offers very obvious conclusions, the complication becomes the entrenchment of systems that produce unjust outcomes. In How Capitalism Underdeveloped Black America, Manning Marable offers that “the system exists not to develop, but to underdevelop Black people”, with each advancement for White society coming at the expense of Black freedom. So, while there are clearly just outcomes, like ending slavery and lynching, ushering in civil rights and voting rights, ending police brutality and now demanding an end to state-sanctioned violence against Black people, such demands require a fundamental transformation of a system that preys on and benefits from Black suffering. While Black freedom movements, including Black Lives Matter, are clearly working for what is just, the disruption that they pose to current systems is often cast by that system as problematic, even violent. Because systems are designed to protect themselves, they utilise their vast powers to contort the messages of those who seek to challenge them. They use the laws that they created, the media that they control and the social structures that they erected to present those who challenge them as essentially “enemy combatants”. Examples of this date back to the hefty bounty put on the head of Harriet Tubman, the bombing of the office of Ida B. Wells, the 40 times that Martin Luther King was imprisoned, the assassinations of King and Malcolm X and the targeting, imprisonment and exile of members of the Black Panther Party, including Huey P. Newton and Assata Shakur. Today, Black Lives Matter organisers and other Black freedom fighters are the new targets. The call for Black lives to matter and for an end to state-sanctioned violence against Black people (and by extension all people) is fundamentally a call for peace. And peace must not be confused with the momentary quiet of submission. The kind of peace sought by Black Lives Matter results from justice. Peace cannot be compelled or forced. It is earned when the people benefit from and see themselves as a part of the societies in which they are housed. Peace is not a tactic of struggle, it is an outcome. As we struggle for a world where Black lives are no longer intentionally and systematically targeted for demise, it means that the systems that prey on us must be not simply reformed but re-imagined and transformed. Peace calls for an end to incarceration and criminalisation in favour of real public safety solutions. Peace calls for the meeting of basic human needs, including safe housing, clean water, healthy food, and medical care. Peace calls for quality education as a universal right and the ability to engage fully in the arts, culture and spirituality. 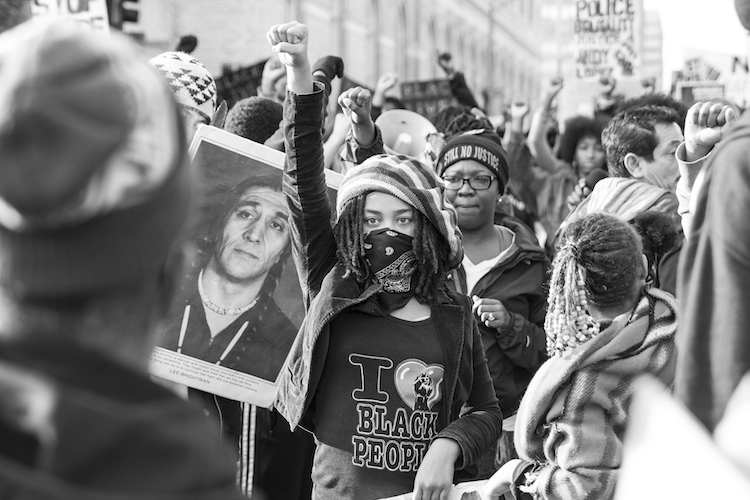 Peace requires revolutionary vision – and Black Lives Matter is a peace movement.